You’d think on a phone that can do as many cool things as the iPhone, push email through one of the world’s most popular email services, Gmail, would be one of them. But for some reason, Google and Apple haven’t turned on the functionality for Gmail accounts on the iPhone. Sure, you can get push email through MobileMe, Yahoo Mail or Exchange, but basic Gmail users are basically out of luck. Until now, maybe. Let me be clear, I’m still not certain that this app will even be approved for the App Store. But if it is, it’s pretty awesome. It’s called GPush; it’s a very simple app that uses the new Push Notifications in the iPhone 3.0 software to ping your iPhone every time a new message comes in. 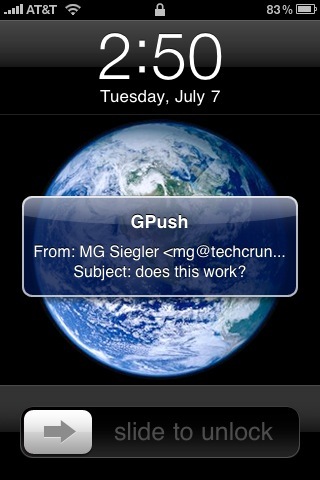 Yes, not only is it push Gmail, it gives you Gmail with notifications. While you might think that could be annoying, it actually works quite well. And both of those methods require the use of iPhone battery life. GPush does not because it’s doing all the work in the background, on Tiverias‘ (the company behind the app) servers. You will still have to open the iPhone’s email app to read the email beyond the subject, but with GPush you will know when there is actually email there to read. As I noted, for all this to work, you have to enter your Gmail username and password into the app. The developers promise that it uses SSL encryption to protect your password and send it to Google securely. So, the big question is: Will Apple approve this app? “Apple should technically speaking approve the application, nothing went into the code that violated either Apple’s or Google’s Terms of Service,” we’re told. Ahh, but it’s Apple, they’ve done quite a few things that don’t make sense when it comes to approving/rejecting apps. And they have a history of being picky when it comes to apps that revolve around email. So, we’ll see. If and when it is accepted into the store, it will cost $0.99.